The UR-100N is an enlarged and upgraded version of the UR-100 family of ballistic missiles, the most numerous ICBM in the Soviet ICBM fleet. The mass production of the missile at Khrunichev enterprise in Moscow stopped around 1990, however the already deployed UR-100N missiles remained in the armaments of the Russian Strategic Missile Forces for the next decade. The UR-100NU (a.k.a UR-100UTTKh) missile also became a base for Rockot and Strela launch vehicles, developed respectively by Khrunichev and NPO Mashinostroenia. 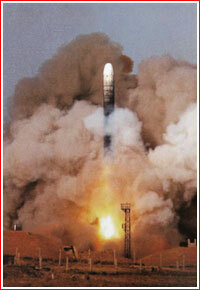 2001 June 27: Russian Strategic Missile Forces, RVSN, conducted a training launch of the ballistic missile on Wednesday, June 27. According to the official information from RVSN, the RS-18 ballistic missile blasted off at 8:35 Moscow Time from Baikonur Cosmodrome and successfully hit its target at the Kura training range in Kamchatka Peninsula, some 7,000 kilometers from the launch site. 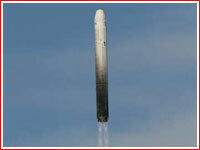 2001 Oct. 26, 12:30: The UR-100NU missile flew a suborbital test mission from Baikonur. 2002 Dec. 10, 8:15 Moscow Time: The UR-100NU missile flew a suborbital test mission from Baikonur aimed to certify missiles of this type for a prolonged service. The mission was previously expected on Nov. 1, 2002. 2004 Feb. 18, 12:00 Moscow Time: As part of the Security-2004 military exercise an UR-100UTTKh ballistic missile lifted off from the silo facility in Baikonur, Kazakhstan. The reentry vehicle of the missile was expected to reach the Kura impact site on the Kamachtka Peninsula some 25 minutes later. In an apparent reference to the Topol launch on the same day, Colonel-General Yury Baluyevsky, First Deputy Chief of the General Staff, told reporters on February 19 that Russia had tested a highly maneuverable vehicle, potentially capable of penetrating antimissile defenses. According to independent Russian sources, the Topol was carrying an experimental warhead equipped with its own rocket thrusters and, possibly, with some sort of air-breathing engine. Such a propulsion system reportedly enables the vehicle to conduct multiple entries into the Earth atmosphere (like a stone ricocheting at the surface of water) and/or enables a powered flight in the atmosphere. Maneuverability of the warhead, along with a lower then traditional trajectory, reportedly makes it more difficult for a potential missile-defense system to track and intercept an incoming reentry vehicle. The Topol was originally designed to carry three warheads, however it was "downgraded" to a single-warhead vehicle to comply with arms-controls treaties. As a result the vehicle obtained extra payload capacity, which allowed the integration of propulsion systems for the new type of warhead. One of the previous tests of the system apparently took place in mid-July 2001. However other Russian sources claimed that an experimental warhead flew on top of a UR-100NU rocket, while the Topol conducted a routine training/test flight. 2005 Oct. 20, 10:30 Moscow Time: Russian Strategic Missile Forces, RVSN, launched UR-100N UTTKh missile from a silo No 175 in Baikonur Cosmodrome. According to the official Russian sources, the vehicle successfully reached its targets at the Kura impact range in the Kamchatka Peninsula. 2006 Nov. 9, 14:35 Moscow Time: Russian Strategic Missile Forces, RVSN, launched UR-100N UTTKh missile from a silo in Baikonur Cosmodrome. According to the official Russian sources, the vehicle successfully reached its targets at the Kura impact range in the Kamchatka Peninsula. 2007 Oct. 29: Units commanded by Colonel Kachkovksy and Birsagurov launched UR-100NU-type missile from a silo in Baikonur Cosmodrome. According to official Russian sources, the vehicle successfully reached its targets in the Kamchatka Peninsula and the goal of the test was certifying the missile for the extended period of service. 2008 Oct. 22, 13:10 Moscow Time: Russian Strategic Missile Forces, RVSN, conducted a test launch of the UR-100NUTTKh ballistic missile. The vehicle lifted off from a silo facility No. 175 in Baikonur Cosmodrome and flew toward the Kura impact range in the Kamchatka Peninsula. The launch was delayed from 10:40 Moscow Time. 2011 Dec. 27, 16:00 Moscow Time: An UR-100NUTTKh missile was launched from Baikonur Cosmodrome on a mission, which successfully validated an extension of the service life for this type of vehicles from 32 to 33 years, Russian Ministry of Defense said. The particular rocket used in this launch was manufactured in 1978 and from 1979 to 2009 was operatinally deployed in Tatishevo and Kozelsk missile units. It was then retired from operational service. According to Ministry of Defense, NPO Mashinostroenia based in Reutov near Moscow, led the effort to extend the service life of UR-100NUTTKh missile. 2012 Dec. 27: A successful launch of RS-18 missile from Baikonur.